On the last track we discussed the terminally ill. Five points we considered are whether or not the grieving child wants to visit the terminally ill, preparing the child for the visit, taking a gift, limiting time, and the benefits of involving a child in terminal illness. On this track we will discuss the involvement of children in funerals. The four topics we will discuss are how funerals help children accept the reality of death, what if the body isn’t presentable, preparing a child for a funeral, and when not to take a child to a funeral. Let’s get started. Do you recall Merle and Justin from the last track? Justin’s grandfather died from terminal cancer. Even though Justin had begun his grieving early, the emotional impact of his grandfather’s death was so powerful that Justin’s first reaction was to dismiss it as unreal. Merle stated, "At first, Justin acted like he didn’t hear me. I told him a second time that his granddad had died and he just kind of shrugged and nodded." I stated to Merle, "The funeral may help Justin accept the reality of death. As he looks at the body, Justin may accept that death has occurred and that he won’t see his granddad smile again. Funerals can make death more real for the child. It may allow Justin to proceed with the grieving process by breaking through denial." Do you agree that confirmation of the reality of death is productive for a child’s grief process? #2 What If the Body Isn’t Presentable? 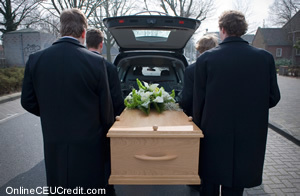 Do you have experience treating clients whose loved one died in a traumatic way which resulted in a closed casket funeral? Callista, age 6, grieved the loss of her mother, Dawn. Dawn had died when the family’s house caught fire in the middle of the night. Though Dawn had died from inhaling toxic gasses, she had sustained post-mortem burns to over 75 percent of her body. Callista’s father Allen asked his therapist how he could help Callista accept the reality of Dawn’s death if there was to be no viewing. Allen’s therapist stated, "What you can do is have a person your child trusts identify the body and then convey directly to Callista that it was indeed Dawn’s body. If Callista ever displays doubt regarding the reality of Dawn’s body, she can go back to the designated viewer and ask, ‘Was that really my mommy?’" Because Callista had always trusted her Aunt Jeanine, Allen asked her to be Callista’s designated viewer. Jeanine agreed and confirmed for Callista the death of her mother. In addition to how funerals help children accept the reality of death and what if the body isn’t presentable, the third topic regarding funerals that we will discuss is preparing a child for a funeral. To help Merle prepare Justin for his grandfather’s funeral, I stated, "Consider taking time to talk to Justin about the funeral. Describe the rituals and go over the process step by step." Merle stated to Justin, "The funeral is a special service for granddad. All his friends and the family is putting it together so we can say goodbye. Remember, granddad might look like he’s sleeping, but he’s really dead. You can touch him if you want to. He’ll be firm and cool, not soft and warm like you and me. Now, you and I are gonna dress up. And no horseplay, right? Also, it’s okay to cry, if you want. I might and so will grandma." Merle made the decision to take Justin to the funeral home before the funeral to help Justin become more familiar with the setting. Merle stated, "I thought it would make it less scary for him." Do you agree that the more children can anticipate what is going to occur, the more comfortable they will be? Can you think of a circumstance under which taking a child to a funeral could be counterproductive? As a colleague of mine experienced with one of her clients, frightening scenes sometimes take place at funerals. Mike, age 38, took his children to their Uncle Carl’s funeral. Carl’s late wife, was the children’s Aunt Sally. Aunt Sally was a notoriously highly emotional person. However, Mike did not anticipate that Aunt Sally would throw herself onto Uncle Carl’s coffin as it was being lowered. Since hearing this story, if the therapist suspects similar circumstances, she suggests to parents to make special arrangements with the funeral director. Funeral directors can usually set up a special time for children to be with the deceased when the potential Aunt Sallies are not present. Think of your Mike. He or she knows his or her family best and how they behave. Are there times when he or she has to be aware of special considerations to arrange a special viewing? On this track we have discussed funerals. The four topics we discussed are how funerals help children accept the reality of death, what if the body isn’t presentable, preparing a child for a funeral, and when not to take a child to a funeral. On the next track we will discuss burials and cremation. Three topics we will discuss are how to explain a burial, how to explain a cremation, and spending time with a body prior to cremation. What are the four topics we discussed regarding funerals? To select and enter your answer go to CEU Answer Booklet.